Too many types of wallpaper to choose from. Wallpaper has come a long way since it was invented. Not only are an astounding variety of decorative effects available, but durability, clean-ability, and removability have also improved significantly. There are several things to consider when selecting a wallpaper. While it can be tempting to focus only on texture and color, the type of backing (or substrate) a wallpaper has is an important consideration. Paper backed wallpapers are the most common. Traditionally, the design was printed directly on the substrate, and the paper was hung as-is. Today, this type of wallpaper is rare. With vinyl coated wallpaper, the design is printed on the paper and then sealed with acrylic. This allows greater resistance to dirt, oil, and moisture. Vinyl coated wallpaper works well in kitchens and bathrooms. Solid sheet vinyl wallpaper, also known as paper backed vinyl, is made by laminating a solid sheet of decorative vinyl to the paper backing. A variation of this is called “in-register” paper backed vinyl. An embossed (raised) design echoes the printed pattern. These types of wallpaper are very resistant to moisture, but will not hold up to hard scrubbing. They also can be hard to remove, because they’re not very porous. Fabric is another common backing material. Woven fabric backings are very durable, and they are typically used in commercial applications. Scrim, osnaburg, and drill cloth are the most commonly used woven backings. Scrim is the most lightweight, while osnaburg and drill cloth are progressively sturdier. Non-woven fabric backings are created from a mixture of cellulose and textile fibers, pigments, stabilizers, and binders. This type of substrate is very stable, allowing the installer to apply paste directly to the wall with a roller and hang the wallpaper dry. Fabric backed wallpapers can also be vinyl coated or laminated to a solid vinyl sheet. Latex/acrylic backings are unusual. They are primarily used with fabric wall coverings and natural materials, such as grasscloth. Stylish wallpaper options are available in several finishes. Borders – Wallpaper borders are narrow strips of wallpaper designed to act as an accent. They can be applied over existing wallpaper, or serve to accentuate a painted wall. The same substrates and design options used to create larger sheets are also available on borders. Embossed – Embossed wallpapers have a raised design. The texture makes them a good choice for masking damaged or uneven surfaces. Some varieties are paintable. 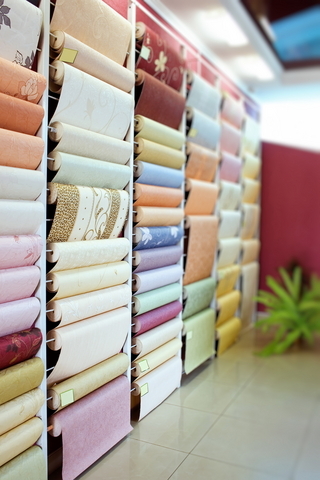 Fabric – Paper-backed fabric wallpaper is typically used in low-traffic areas. Hanging it can be a challenge; the fabric must be pulled taut, but not so much that it distorts. Flocking – Flocked wallpapers are textured. Cotton, silk, or synthetic fibers are applied to adhesive or varnish to create a raised pattern or velvety effect. Flocking is delicate and difficult to clean, but provides an elegant solution in a guest room or study. Foil – Foil papers consist of a paper or scrim backing laminated to a metallic foil or mylar. They can be embossed with raised designs. Foil wallpaper is dramatic, but can be hard to work with and tends to accentuate flaws in the wall behind it. Glass Textile – Glass textile wall coverings are made from fiberglass mixed with starchy binders. They are durable, paintable, and moisture resistant, but hard for the DIYer to install. Murals – Murals have a scene printed over multiple panels of wallpaper. Durability and quality depend on the type of substrate and decorative surface. Natural Materials – Natural materials laminated onto a paper backing are gaining in popularity due to the “green” movement. Materials include grass, coir, hemp, cotton and jute. They provide textural interest; some are dyed. Because the materials are natural, variations in color and texture are common. Natural materials are susceptible to moisture, and cleaning these papers can damage the finish. Paintable Papers – There are two classes of paintable papers: expanded vinyl and molded. Expanded vinyl wallpaper is created by printing liquid vinyl onto a paper backing. The wallpaper is then heated, causing the vinyl to expand and create a raised effect. Molded wallpaper also typically has a paper background. The paper is molded, instead of printed, and the decorative surface is made from linseed oil and wood flour. Polyolefins – Polyolefins are synthetic textiles designed to mimic natural material wallpapers. They have the look and feel or naturals, with the greater durability and stain resistance of synthetics. These papers are mounted on paper or acrylic backing. String Effect – String effect wallpapers are also best suited to low-traffic areas. Fine threads are laminated directly onto the substrate. Temporary Wallpaper – Temporary wallpapers have an adhesive backing. They are reposition-able and easily removed, so they are a good choice for adding some color to your rental. In addition to sheets, these papers are available as precut shapes or phrases. One popular brand is Tempaper. Wallpaper often carries labels to help the user determine washability and durability. Abrasion Resistant – Wallpaper bearing this tag can withstand scrubbing, scraping, and abrasion. Excellent for high traffic areas. Colorfast – Colorfast wallpaper is resistant to changing color when exposed to sunlight. This may not be listed on the tag- most modern wallpapers are colorfast. Peelable – Peelable wallpapers can be removed by dry-peeling. This removes the decorative top layer, but leaves behind the substrate, which can be papered over. Pre-pasted – Pre-pasted wallpapers are quite common. The backing contains a layer of adhesive that can be activated with water. Many people choose to use commercial adhesives along with their pre-pasted papers for better results. Scrubbable – Scrubbable wallpaper can be cleaned with detergent and a stiff brush. Best for kitchens, where grease and soil can build up. Stain Resistant – Stain resistant wallpaper is good for kitchens and children’s rooms. This type of wallpaper is designed to still look good after soil is removed. Strippable – Strippable wallpapers can be remove by dry peeling. Both the decorative surface and the backing are removable, leaving just a thin layer of adhesive behind. Washable – Washable papers can be cleaned with a sponge or rag and a detergent solution. Hard rubbing or scrubbing will damage them. Commercial wall coverings are used in schools, hotels, office buildings, and other high traffic applications. Wallpapers for commercial use are easier to clean, more abrasion resistant, and typically less showy than their residential counterparts. There are also several non-decorative types of commercial wall coverings. Acoustic – Acoustic wallcoverings are made from a combination of olefin and polyester and provide sound absorption for meeting rooms, auditoriums, and theaters. The noise resistant coefficient rating determines how much sound the wall covering will absorb. The higher the NCR, the higher the sound reduction. Cork – Thin sheets of cork provide natural insulation and sound resistance. Natural cork provides visual interest and its sponginess makes it the perfect medium for bulletin boards. Electromagnetic – Electromagnetic wall coverings have a surface that safeguards electronics from the effects of static electricity. Used in server rooms and other areas that contain sensitive electronics. White Board – This white, plastic coated material can be written on with dry erase markers and wiped clean. Also useful for providing a flat surface for slide shows. Uses include meeting halls and classrooms. Wood Veneer – Thin slices of wood are laminated to a fabric backing. This type of wall covering is fairly rare, and can be quite expensive due to the difficulty of grain matching.